The picturesque town of Westerly is located on the southwestern shore of Rhode Island. Founded in 1669 by John Babcock, the town today is comprised of a beachfront community with around 23,000 inhabitants. Westerly is bordered on the west by the Pawcatuck River. The river is remarkable for its unique species of Westerly salmon. The river meanders for fifteen miles before meeting up with Little Narragansett Bay. Along Westerly’s coastline, there are numerous salt ponds. Historically famous for its granite industry, these days, Westerly is known for textiles and tourism. It is believed that the town was named for its location relative to the geography of Rhode Island, as it is the state’s westernmost town. However, some historians believe that its name may have been derived from the English village of Westerleigh, in the county of Gloucestershire. The main reason for this view is that Elder John Crandall, one of the founding fathers of Westerly was from that quaint English village. Between the 1890s and the 1920s, Westerly marked the convergence of four trolley lines which ran from Norwich and Westerly Railway, the Ashaway and Westerly Railway, Groton and Stonington Street Railway, and Pawtucket Valley Street Railway. The Eagle’s Nest Gallery: a great shopping experience which includes delightful gifts and works of art such as Vera Bradley, Brighton Handbags and Jewelry, and The John Medeiros Collection. Lilly Pulitzer: This chic, colorful boutique is the place to go for designer labels and prints and beach-ear for women. The Malted Barley: A well as great bistro food, this bar is also renowned for its extensive selection of beers. The Twisted Vine: This family-run restaurant is a great place to be if you want to sit by a roaring fire on a New England winter night. The food is delicious, and the wine and beer are flowing. Westerly Railroad Station, which was completed in 1912, and the Industrial Trust Company Building, which was completed in 1916. Rhode Island’s Watch Hill Lighthouse was built in 1745 by the Rhode Island colonial government. The original tower was destroyed during a storm in 1781. The new lighthouse was built in 1806. Twenty-one years later, a revolving light was installed so that this lighthouse could clearly be distinguished from Connecticut’s Stonington Harbor Light. Watch Hill Lighthouse was closed in 1855 due to erosion and moved away from the edge of the bluff. The current lighthouse was opened in 1856. It stands 45 feet tall. In 1872 the steamship Metis was shipwrecked off Watch Hill; 130 people were killed. The following year, the Congressional Gold Medal was given to Captain Jared Starr Crandall for his brave rescue service with the Metis. In 1879 Crandall’s widow became the first woman lighthouse keeper, right there at Watch Hill. The Larchmont steamship ran into a schooner in 1907, just four miles from Watch Hill Lighthouse. More than 200 people died in the resulting wreck. Click here to learn more about this amazing disaster >>> In 1938, the lighthouse was severely damaged in a hurricane. In 1962, the Leif Viking ran aground just yards from the lighthouse. Although no injuries were sustained, the ship was stranded for nine days before a two it back to New York City. After its automation in 1986, Watch Hill Lighthouse was leased to the Watch Hill Lightkeepers Association. Built in 1910, Westerly armory was designed by William R. Walker & Son. This firm had previously designed several ber of other public buildings throughout the state of Rhode Island. The Westerly Armory was added to the National Register of Historic Places in 1996. The building is currently a preserved military and community museum and is open to the public. 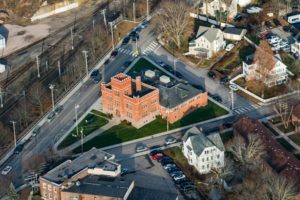 It also houses an historic library and serves as the home of the Westerly Band, which takes great pride in being the oldest civic band in the country. Another of Westerly’s registered historic buildings, Lewis-Card-Perry House was built circa the 18th century. It is a 1½ story Cape-style residence. Unfortunately, by 1905, the house had deteriorated to such an extent that part of it had to be demolished. In 1929 Lydia and Harvey Perry hired Norman Isham, a prominent architectural historian, to renovate the remainder of the house and to reconstruct the demolished south portion. Today the house is a good example of restoration of a colonial-era house. It is a popular site for history buffs. Wilcox Park Historic District is located on Westerly’s High Street. It is always open to the public, and there is no entrance fee. The 14-acre park has been listed in the National Register of Historic Places since 1973. The historic neighborhood includes 84 homes and other buildings surrounding the park. The park was designed by Warren H. Manning in 1898. Originally the park was home to plants native to the Rhode Island region, but during the 1960s the park was developed into a breathtaking arboretum. Some of the park’s main attractions include a garden of the senses, an herb garden, and a dwarf conifer garden. Wilcox Park hosts the Colonial Theatre’s annual Shakespeare in the Park productions. Rhode Island’s Napatree Point is a long sandspit produced by longshore sediment. It is located in Block Island Sound. The spit was crescent-shaped with a 1½ mile extension at the north, called Sandy Point. However, since the hurricane of 1938, it now stretches 1½ miles westward from the Watch Hill business district, forming a protected harbor. Napatree’s name is derived from ‘nape of trees,’ and originally it was a densely wooded area. Click here for a great article about how Napatree Point got it’s name >>> Sadly the trees were destroyed in the Great September Gale of 1815. Currently, Napatree is a conservation area, and it makes a good location for hikers and wildlife lovers. Click here to learn about Fort Mansfield – The fort at the end of Napatree Point – great, fun reading! For anyone looking for a fun day out for the whole family, Water Wizz is definitely worth a visit. The water park has 35 feet high waterslides and 50 feet high-speed slides featuring tunnels and dips that reach into pools. You’ll find the adventure park next to Misquamicut State Beach. The 18-hole Winnapaug golf course boasts ocean views like no other. This venue is Westerly’s only public golf course, and it features 6,361 yards of golf for a par of 72. Designed by Donald J. Ross the course was opened in 1922. The Golf club offers lessons for anyone who wishes to improve their game. The clubhouse restaurant is open to the public for the summer season and can be hired for private functions during the winter months. This elegant Georgian mansion was built around 1734. Home to the Babcocks during the colonial era and the Smiths during the Victorian era, the house was restored in 1928. It is currently tastefully furnished with pieces dating back to the Babcock years. It’s a popular venue for antique lovers and history buffs. Once a Greek Revival Church, the Granite Theatre is situated at the end of Granite Street. The building was completed in 1843. The renovated building has been hosting high-quality shows since 2000. Forthcoming productions include Dial M For Murder, Bell, Book And Candle, Proof, and A Comedy of Tenors. 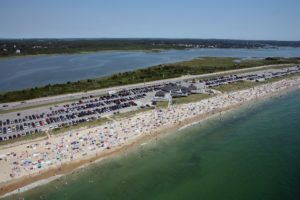 Westerly’s Atlantic Beach Park is located in Misquamicut, on Rhode Island’s south shore, overlooking Long and Block Islands. This delightful landmark has been drawing visitors since 1921. Owned and operated by the Trefes family, the park has become a true summer tradition. The main attraction is the Herschell-Spillman Carousel which was constructed around 1915. Three of the carousel’s horses were created by famous master carver Marcus Ilions. As well as the carousel, the park has other rides including bumper cars, a kiddie dragon coaster, and monkey barrels. Atlantic Beach Park is also home to the Windjammer Surf Bar, Dusty’s Dairy Bar, and the Suicide Snack Bar. Langworthy Farm Winery is situated on the famous Scenic Router 1A, less than a mile from the ocean, near Misquamicut. The location is perfect for growing Vinifera grapes, and the winery has been in production since 2002. AS of 2008, the winery has been producing eleven different wines. The farm also boasts a welcoming bed and breakfast. Shelter Harbor was built circa 1800 and was originally a farmhouse. Today, the inn is a charming, comfortable, and friendly place to stay. 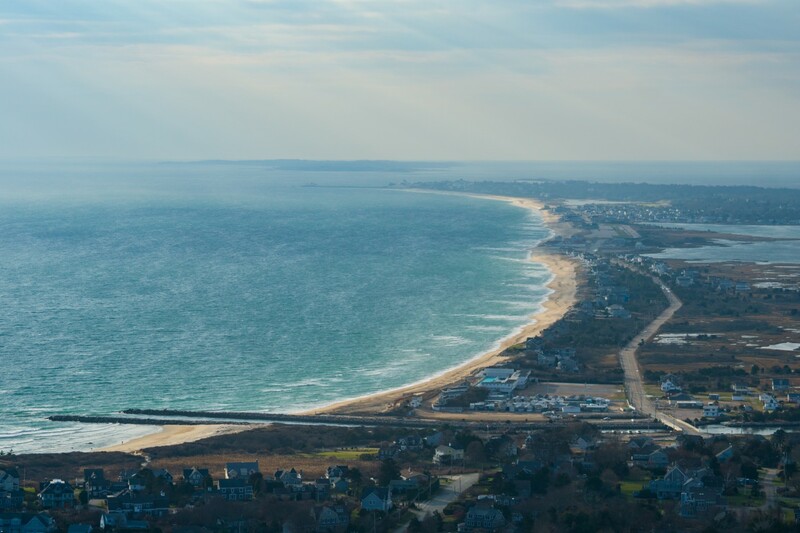 It’s located close to one of the most stunning sections of the Ocean State’s shoreline. Shelter Harbor Inn has 24 guestrooms, and guests can enjoy private beach access in Weekapaug. Breakfast and dinner are served daily, and guests may also join the Shelter Harbor Paddle Tennis Club. Pets are permitted in Shelter Harbor’s barn. The Artists’ Cooperative Gallery of Westerly (ACGOW) is a gallery dedicated to exhibiting new fine art shows each month. The art is created by ACGOW visiting artists and member artists. All Members of the public are invited to all ACGOW shows, and there is no entrance fee. As well as the exhibition, the gallery also offers class, lectures, and workshops. Every spring, ACGOW sponsors a regional art show for artists throughout the Northeast. ACGOW was founded in 1992 by artists Ginger Mitchell, Sandi Gold, and Bruce Goodsell. The gallery currently has around 50 artist members. It can be found in the former Montgomery Ward building. In 2000, the Hasbro Toy Company gave Rhode Island artists 50 6-foot tall fiberglass Potato Head statues in celebration of Mr. Potato Head’s 60th anniversary. Westerly’s Mrs. Potato Head statue is one of the ten remaining. The 6-foot tall statue, named Sunbaked 1966, is dressed in a bikini, bathing cap, sunglasses, and flip-flops. She was designed by Block Island artist, Cindy Kelley. Mrs. Potato Head’s “outfit” is made from a mosaic of broken tiles and dishes. 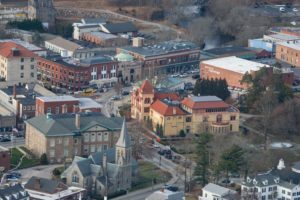 Whether you are relocating to Westerly or taking a vacation, you will find plenty to do in your spare time. It is a friendly town which welcomes newcomers, and you will be made to feel right at home. 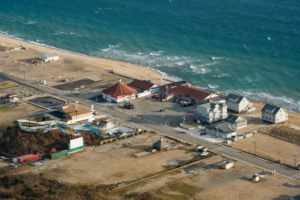 If it’s your first time in Westerly a great way to get to known the town is with a helicopter ride.